What is a Whiskey Sour? How to make a Whisky Sour? What does a Whiskey Sour taste like? What glass to use for a Whisky Sour? There is nothing much on here now, but I will add content as I learn it. if bourbon, than why isn't it calles "bourbon sour"? ice in whisky? normally that is not done! Looking up some of the answers. Ah, there is also "bourbon Sour"! Interesting! That would mean there might be "malt whisky sour" too! Or a "Rye Whiskey Sour". 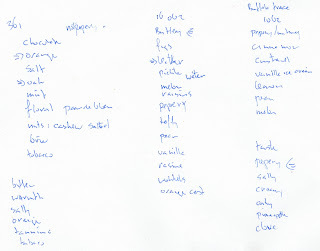 I'm not going to say how its done, so here are some of the recipe links i found. Experiment: I will not mention this blog on my facebook, instagram or twitter. I want to see if this blog gets read regardless of any advertising on my end. 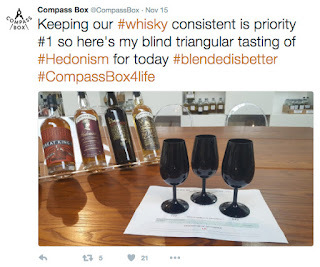 Compass box shares information on internet via multiple channels one of which is twitter. Consistency in whisky is important for blends and single malts alike. 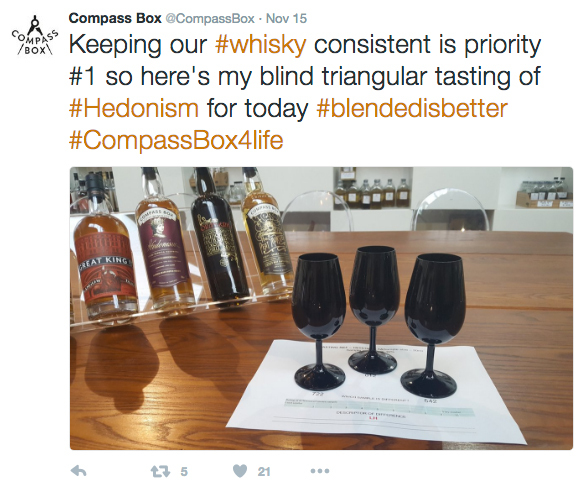 I took this tweet by compass box as an opportunity to find out how whisky-makers do this. What can we learn from this tweet and what can we learn from the photo? The first thing I see are the three black ISO 3591:1977 sensory analysis - apparatus - wine tasting glasses. There glasses are prescribed when doing sensory evaluations of liquids, such as whisky. I have blogged about these glasses before. See this link. The black glasses are to prevent the assessor from identifying any visual differences between samples by looking through a transparent glass. This prevents identifying the odd one out and thus influencing the assessor. The "blind triangular tasting" that is mentioned is standardised via a number of ISO standards, depending on how the tasting is performed and for which purpose the tasting is performed. In total there are 17 ISO standards in the "Sensory analysis -- Methodology" section. From the word "triangular" in the compass box tweet I deducted that this could be the ISO 4120:2004 methodology. So I asked on twitter and the answer was positive. I found a legal copy of this standard and started reading. In the photo you see the glasses standing in a triangle. This is according to point 7.2 of the standard. Tasting is done from left to right. Two of the glasses are filled with the same sample of the product. The third glass is filled with the other sample product. Six sets of combinations of these samples are possible and the assessor is not aware of which set sample is in which glasses. Below the glasses are three numbers. These are chosen at random by the person that is setting up the procedure. Only the person setting up the tasting knows which numbers correspond with which product. The numbers intentionally mean nothing to the assessor so to not cause bias. - see if the assessor is not able to spot the odd one out in order to show that the odd one out is indeed "similar"
This last kind of test is what compass box wanted to show here. Is the new batch of hedonism so similar that the assessor cannot spot the odd one out. That is off course what John Glaser wants, consistency between two batches of hedonism. The batches of hedonism used here are two glasses of the May batch and one glass with the February batch. I trust the batches were indeed found similar. In other blogs I will go into the other ISO standards that give details on how to properly taste, nose, make tasting notes, rate etc. As a whisky nerd I find this all very interesting indeed. I would love becoming an assessor. The training of the assessor is also standardised in an ISO standard. The training of the coordinator is standardised, the glasses are, the preparations of the samples, the cleaning of the glasses, the room, the layout of the room, the tasting notes, the scoring etc. Etc. All is standardised in ISO standards. I had a night to myself last night. My wife's sister had come by to talk and this was an option for me to retreat to my "office" and really take the time to nose and taste the Laddiemp4 drams. I had wished I would have been able to join the live tasting on October 13th when I rather coincidently was on Islay. 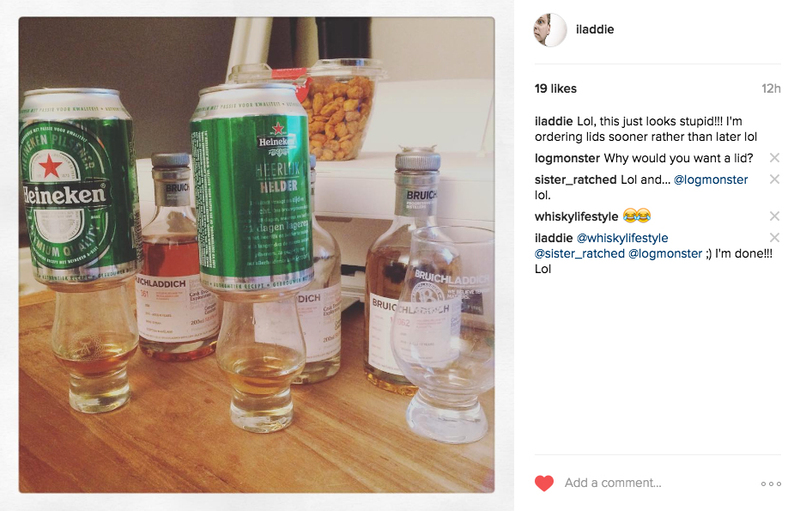 I had asked at the Laddie Store to the guy behind the counter if he could do me a really really big favour. He called in the aid of Ailse and she asked Adam. Adam was Adamant ;) ... the place was full. 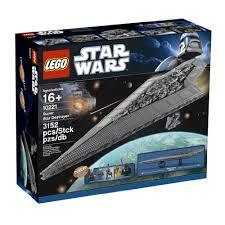 I got a bottle of the 16-062 so console me ... it has consoled me as the picture below shows. I had been tasting my second bottle of the 16-062 more than the others. I had postponed it till a propper time. The time was now. I had cleaned three glasses. I had gotten a glass of water and a teaspoon. I had also gotten a pack of "Katjan Pedis" nuts, which I sat aside for later because this stuff will totally overpower your palette. Guided by Adam Hannett on Youtube I am all set. I have made an excel version of the scotch whisky tasting wheel. Divided into the Wishart taste groups. I plan to use that to log my tasting notes. It doesn't work editing an excel file and at the same time nose and taste, so this nerdy need needed to wait for later. Make notes with pen and paper is what I do. Starting of with the Cask #361 Syrah matured whisky. Light tannins﻿ on the aftertaste. If you are wondering why the Heineken can is on top of my glass. That is because I did not bring covers from downstairs. Got some fun comments online on my instagram. Anyways, with this Syrah I had been wondering what notes I would get from this. Turns out the dried dark fruit notes which you typically get from Sherry matured casks are not in here as the predominant notes. 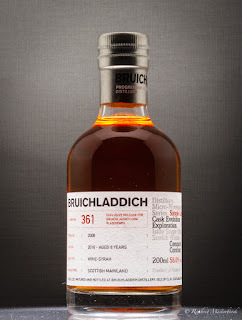 My first reaction to this dram was "Cask 361 is friggin amazing". The orange and chocolate you would also get in a sherry matured dram are there. But not so much the salty influences of the floral notes. Interesting!! Buttery, I used buttery but could also used "creamy"
Wokkels? 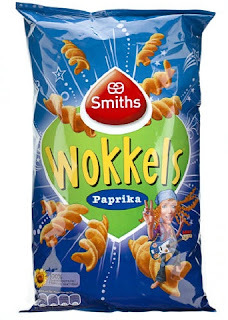 Yes Wokkels. I had gotten this note before on a USA Dram from Koval also. I am suspecting the crispy cloy taste of these pretzels find their origin in the malt. This is where tasting notes don't translate internationally. 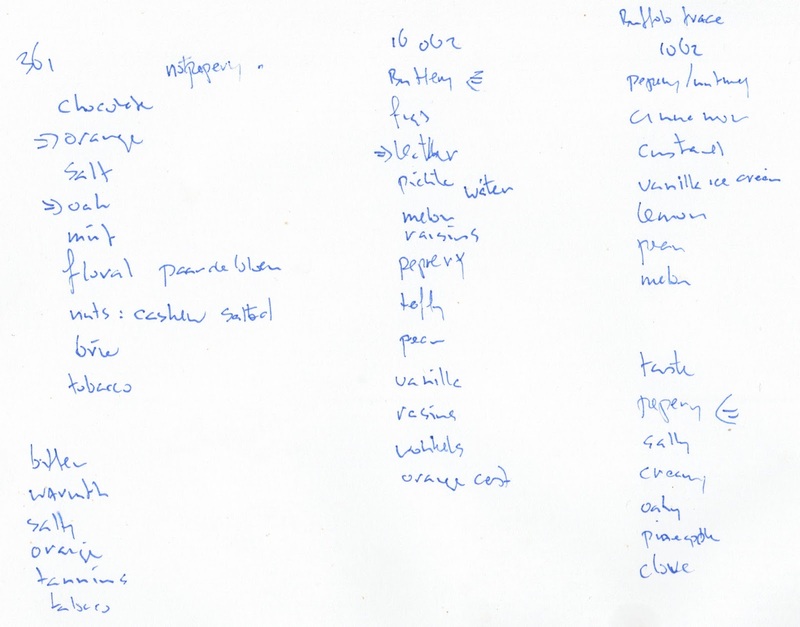 I actually blogged about culturally dependant notes in the past. This dram is also not a typical Sherry. This is probably because it is a combination of woods. I re-watched the part where Adam explains. 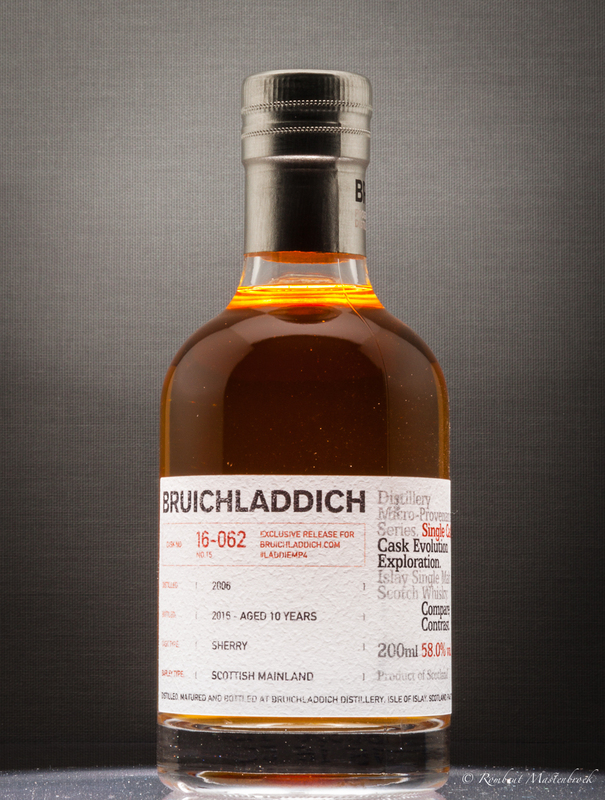 Its matured in first and second fill bourbon and from 2014 in PX and Oloroso casks. So this is a hybrid whisky with lots of different woods. This explains the combination of notes I got. 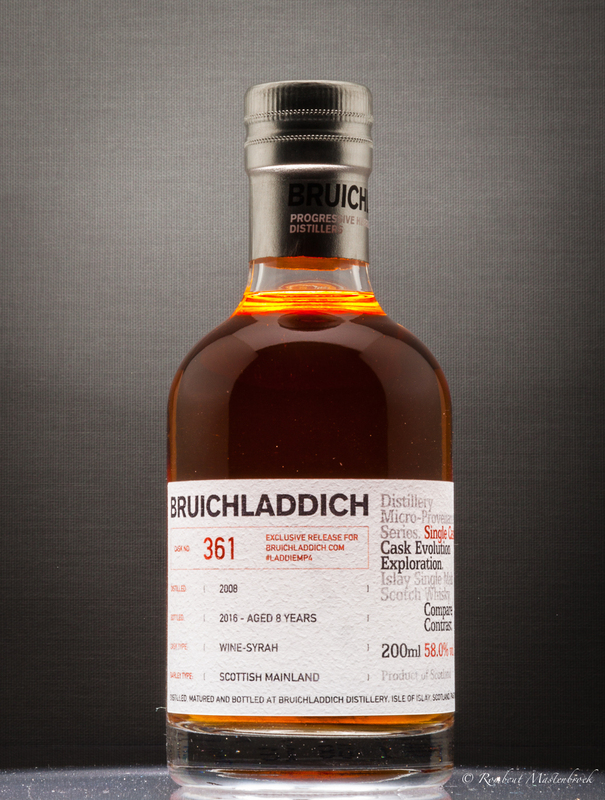 The third dram Cask 1062 is a Bourbon matured dram. It was matured in a Buffalo Trace cask. This one for me had a real "oomph" to my palette. An "oomph" I like. 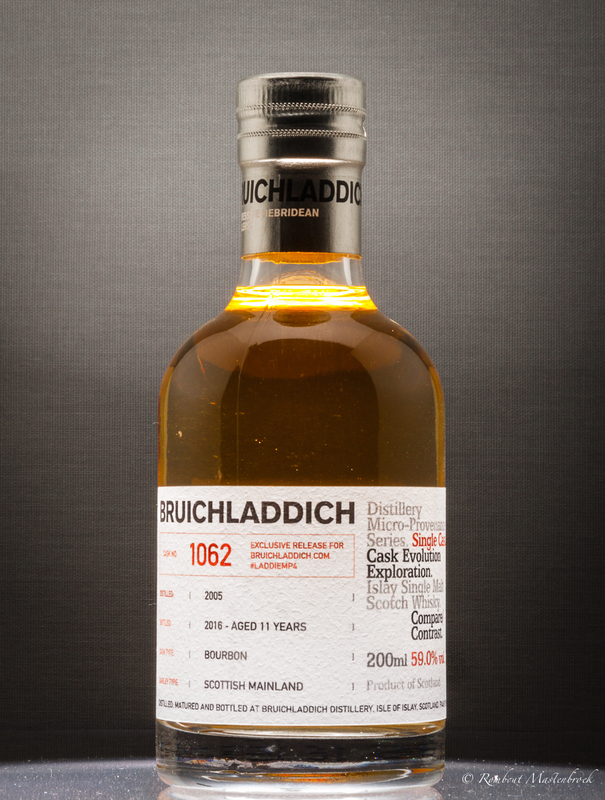 I do like the notes from the sherry, but I find the floral fruity tad spicy notes from first fill Bruichladdich a beautiful thing. I will spend more time with these drams and improve and reconfirm my notes. I found that tasting these side by side really improves the sense of differences in smell. I makes the notes stand out more. I kept the Heineken cans on there as I sat and re-smelled them all. Some notes were gone, some became available. Its beautiful how these drams develop. 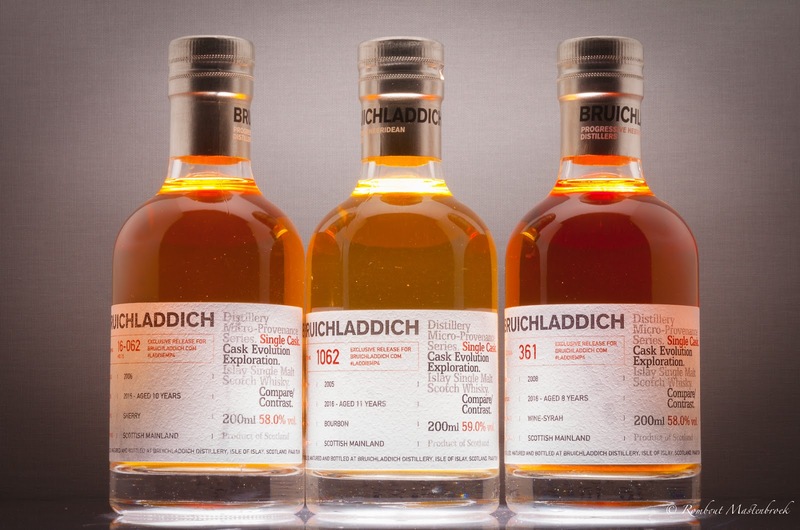 The visit to Bruichladdich would be three fold. First a tour at 11, then a warehouse tasting at 12 and later the purchase of one of the Valinch bottles. We payed the tickets and the tour began. First up was the barley mill. The tour guide explained how we could take pictures of everything but any photos of her would mean an added £5,- . She was naturally kidding! But we got the message. The background of Bruichladdich was given. How it was set up by the Harvey brothers back in 1881. How the slope of the hill was used in order to use the natural flow of water through the buildings. The mill for the barley is the original one (minus spare parts and repairs). The steam engine that powered the belt was replaced by an electric motor, but other than that the whole place is original. I'm sure some of the wooden parts have been replace over the years but all in all it looks all very 1881-ish. Very cool indeed. There is a basked next to the mills to show the different stages of milling from barley to flour. The basked with flour was empty. It is emptied out by a lady who uses the Octomore barley for her bread! Would love to buy a loaf of that!! Anyway, the flour/grist is moved to a container where it is contained until the container is emptied in the mash tun. I tried making another "contained" reference here by but I can't. Sorry. Moving to the mash tun we learn that the cast iron mash tun is still in use even though modern regulations prescribe a stainless steal one. The mash tun predates the regulation. Hell it predates the invention of stainless steel! I wanted to ask of the rathe brown rusty looking cask iron is not a Health risk, but i didn't. It looked beyond further oxidation so I'm sure it's inert. The blender was damaged during a particularly firm mash. It was out of commission for a lengthy time. The parts that are broken were replaced. This is where the legislation kicks in because the new parts do look rather stainless steel like. As an engineer I wanted to ask why the new parts were a round turned part and not milled in an square shape like the old ones. The fluid dynamics around a round part would be rather different to a square section. Wouldn't it adjust the blending function? I didn't ask. I'm sure it has something to do with available machines on Islay or just plain cost driven. I was pretty sure the tour guide would not know. Plus the answer is not important. Since the mash tun is open the efficiency of the process is less. Also the temperatures used during mashing differ from the ones I noted at Ardbeg. Seems logical. A different set of conditions ask for a different set of process parameters. Mashing is done using two "waters". Ones the mashing is done the wort is move to a free clean wash back. A 3th and 4th water are added and kept as the 1st and 2nd water of the next mash. Next we moved to the next room. The wash-back room where all the fermenting takes place. There are six wash backs at Bruichladdich. All Douglas Fir wood. All pretty tall. I made a photo down to get the height, but in a photo you just loose the sense of depth. Our tour guide lifted some of the ends to see which tank was a what stage. The ones we looked in were producing lots of CO2 and thus alcohols. The fluids were happily bubbling away so to speak. We could smell the content. Our tour guide did not put her face in the hole like most of us did. To much CO2 she explained. So I scooped the smell with my arms. Got some frowns from the other people in the tour, but they started copying my approach and learned why I did so. The theory I got from my tour at Ardbeg the day before. Handy stuff. I cannot remember if I had the same reaction to the beer like smell that I got at Ardbeg. I'm sure it had. I'm sure it had fruity malty cereal banana beer-like notes. I just can't remember as I am writing this weeks later (November 10th). Now I need to redo the tour and make notes! Darn!! We were asked if anyone would have a taste. Are you kidding!? Bottle the stuff and sell it!! It's amazing tasting brew!! After the tour-guide put it down I snuck over and helped myself to another drink. Savouring the taste and smell as much as I could. Closing my eyes to lock out unneeded sensory input. Shame I can't remember! Me dork! Looking at the still room we could see a familiar face. It was the Swedish tour guide Mia and her group. We waved. On to the still room. There is a purpose build platform you can stand in to watch the room. Its safe during operation hours to stand there instead of walking between the operation. Clever stuff. Bruichladdich has 5 working stills. Two wash stills, two spirit stills and a Gin still called ugly Betty. The Gin made at Bruichladdich is called "the botanist". All herbs that go into the Gin are on the wall on a big placard. We are told that when Jim McEwan made this Gin he was told that the maximum of herbs would should needs to be 5 maximum. So he put in 22. I have never took the time to understand Gin making but I will. We were free to take any photos we wanted of anything, so I did. I took some panoramas and detail photos. 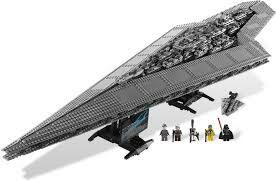 It gives a nice overview of the whole setup. Selfie at the spirit safe. Round about this time a group of people walked in. I spotted Ailsa, the kind lady who had given me the laddiemp4 bottle as consolation for not being able to be at the live tasting of laddiemp4 that past Thursday. She was touring with guests and her family. After pretending to make a cut and making selfies at the stills I thought i recognised Allan Logan, former mashman and now distillery manager, so I addressed him as such. I was close. It turned out the be mashman Graham Hayes. I knew that! Just tad dyslectic with names and faces. He said he and Ailsa had recognised me as being iLaddie. Was I indeed? Yes I was/am! Great to meet one of the makers. Selfie time! We had a short but excellent talk. We shook hands and were both on our ways. We were off to the the laddie shop to start the 12:00 o'clock warehouse tasting! That's for the next blog!